Nuclear Magnetic Resonance (NMR) spectroscopy is a powerful and theoretically complex analytical tool. Basic 1H- and 13C-NMR Spectroscopy provides an introduction to the principles and applications of NMR spectroscopy. Whilst looking at the problems students encounter when using NMR spectroscopy, the author avoids the complicated mathematics that are applied within the field. 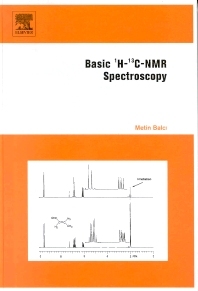 Providing a rational description of the NMR phenomenon, this book is easy to read and is suitable for the undergraduate and graduate student in chemistry. 1.1. Structure Elucidation and NMR. 1.2. Development of NMR Spectroscopy. 2.1. Magnetic Properties of Atomic Nuclei. 2.2. Spin Quantum Numbers of Elements. 2.3. Behaviour of an Atomic Nucleus in a Magnetic Field. 3.1. Local Magnetic Fields Around a Nucleus. 3.2. The Unit of the Chemical Shift. 3.4. The Factors Influencing the Chemical Shift. 4.1 Explanation of Spin-Spin Splitting. 4.3.Factors Influencing Spin-Spin Coupling Constants. 5.2. Examples of Coupling with Different Protons. 9.1. Development of 13C-NMR Spectroscopy. 9.2. Comparison of the 1H and 13C Nucleus. 9.3. The Factors Influencing the Sensitivity of the 13C Nucleus. 9.4. The Factors Increasing the Sensitivity in 13C NMR Spectroscopy. 10.1.Classical Treatment of Absorption and Resonance. 11.1. Introduction to Pulse NMR Spectroscopy. 11.2. Continuous Wave and Fourier Transform NMR Spectroscopy. 11.3. Interaction of a Monochromatic Radio Frequency with the Sample. 11.5. Routine Pulsed 13C-NMR Measurement Techniques. 11.7. Nuclear Overhauser Effect (NOE). 11.8. Measurements of NOE Enhanced Coupled 13C NMR. Spectra: Gated Decoupling. 11.9. Off Resonance 1H Decoupled and Selective Decoupled Experiments. 11.11. Sample Preparation and Solvents. 12.1. Diamagnetic and Paramagnetic Shielding on Proton and Carbon Atoms. 12.2. Factors which Influence the Chemical Shifts. 14.1. Couplings over One Bond (1JCH). 14.2. Couplings over Two Bonds (2JCH) (Geminal Coupling). 14.3. Couplings over Three Bonds (3JCH) (Vicinal Coupling). 15.1 Measurements of Relaxation Times. 15.3. Signal Enhancement by Population Transfer: Selective Population Transfer (SPT) and Selective Population Inversion (SPI). 15.4. INEPT Experiment: Insensitive Nuclei Enhanced by Polarization Transfer. 15.6. DEPT Experiments: Multiplicity Selection of CH, CH2, and CH3 Carbon Atoms. 16.1. The Basic Theory of 2D-Spectroscopy. 16.2. COSY Experiment: Two Dimensional Homonuclear Correlation Spectroscopy. 16.3. 13C-13C Correlation: INADEQUATE Experiment.